Today we visit a place that had long been on my bucket list, Pine Creek Gorge, aka the Pennsylvania Grand Canyon. We've driven through the region many times, specifically through the beautiful I-99/US 15 Corridor through Wellsboro and the Williamsport area, but we never made our way over to the PA Grand Canyon. This is one of those places that was always on my radar, but we could never find the time to visit this awesome place. Pine Creek Gorge, aka the PA Grand Canyon, became a tourist draw during the depression era in the 1930s, similar to many other natural tourism draws. The CCC (Civilian Conservation Corps) one of the groups formed as part of the New Deal Programs proposed and created by FDR during the Great Depression, built roads and facilities at this natural wonder, as they did across this nation. Much of the infrastructure remains intact, allowing us to enjoy the wonder of this awesome natural landmark. Pine Creek Gorge, aka the Grand Canyon of Pennsylvania! The PA Grand Canyon moniker dates back to the 1930s, when roads and facilities were added to allow for accessibility to this place. A promoter added the moniker to help boost tourism to the region. While in scope, the Pine Creek Gorge does not compare to the actual Grand Canyon, this is truly one awesome place to see. It averages roughly 1000 feet in depth, and is two miles wide at its largest point. This was and remains an important lumber area for the state, though conservation efforts have thankfully lead towards a thriving second growth forest within the gorge, and surrounding Tioga State Forest. The selective logging appears to be getting done in a sustainable fashion that is leaving the forest intact. You can learn more about the heritage of the lumber industry at the Pennsylvania Lumber Museum in nearby Potter County. The following article dates back to 1937 from the Beaver County Times, from when the area really began to get noticed as a roadside tourism destination. 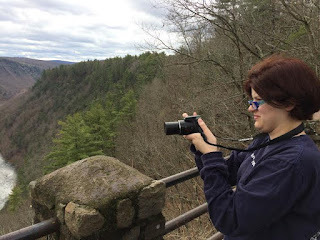 We approached the PA Grand Canyon from the northeast, passing through the beautiful Interstate 99/US 15 Corridor, the 287 corridor, and eventually the Route 6 Corridor, which we ended up continuing on across the state once we left the Canyon. This photo was taken at the Tioga-Hammond Lakes Recreation area, a popular spot for anglers and boaters within a scenic part of the state. The Tioga-Central Scenic Railroad runs through the Hammond Lakes area. We started on the East Rim of the Canyon at Leonard Harrison State Park. This cabin was built by the CCC in the 1930s. A beautiful pavilion that is home to a visitors center and guest facilities serves as a portal to this stunning overlook on the East Rim of the Canyon. The first glimpse of the canyon! This was one of those days where the weather was questionable. We were unsure of what to expect. It was perfect! The clouds were low, so we were actually truly in the clouds in the gorge. A look down to the floor of the gorge. We were truly in the clouds! Both rims of the canyon have state park camping available. Adjacent to the creek bed, you can see the Pine Creek Rail Trail. This trail runs 65 miles from end to end and it allows for a tour through the length of the entire PA Grand Canyon. One of the greatest treats to sightseeing in the PA Grand Canyon is birdwatching and spotting wildlife. I think we saw only one other visitor on the weekday that we visited. The place was silent. We saw many birds flying around, including this turkey vulture. We also saw turkeys, deer, hawks, and more. It is clear why this was named Pine Creek Gorge with how many pines are located throughout this picturesque place. It is also clear why Pine Creek Gorge was given the PA Grand Canyon Moniker. It truly is a spectacular gorge. I always love seeing these tributes to the CCC workers. These young men would go on to become "the Greatest Generation," the group of young men that worked through the Great Depression, went on to win World War II, bring to us the greatest period of widespread economic prosperity, and worked to knock down racial barriers. Many of these young men were given a chance in our society through working in the CCC. We still enjoy and use much of the infrastructure that these young men improved and created more than 70 years ago. We have the opportunity to enjoy many of these awesome landmarks because of the work of these young men. A state park campground is within walking distance of this vista, along with picnic and playground facilities. There is also a private campground and motel just down the road from this point, in addition to a privately owned 100 foot lookout tower that was relocated from Valley Forge. Now we have ventured over to the West Rim of the PA Grand Canyon. This is the main lookout point from Colton Point State Park. Leonard Harrison State Park is located directly across the gorge. There must have been about twenty turkey vultures sailing around like kites around the point here. It was really quite a sight to see. Brit was having a blast photographing these birds of prey. "Let's lay down for a minute and catch some sun!" Seriously though, I've never seen them do this before. This guy was just sitting there for ten minutes like that. "Nah, the sun feels too good!" Such a beautiful place! The questionable weather forecast made for some dramatic and awesome looking skies! Lookout Point on the West Rim Trail. A lookout point on the West Rim Trail. A view of Leonard Harrison State Park from across the gorge. The skies really started clearing up for a short time at this point. The weather was absolutely perfect. From this point we meandered through the network of stone roads around the Tioga State Forest. We ran into all kinds of wildlife throughout the ride in this scenic area. We eventually made our way back to Route 6 and ventured through the remote and gorgeous Pennsylvania Wilds region. If you love natural beauty, the Pennsylvania Grand Canyon is a place that you must visit. This is a place that needs to be on your bucket list of things to check out in Pennsylvania. Colton Point at Colton Point State Park. Be sure to use directions to this point so you can accurately maneuver around the canyon.